The London ExCel centre was brimming, bustling with people, packed with stands covering everything one would need for triathlons, climbing, diving and the great outdoors. It was the Telegraph Outdoor Show. There amongst the stands offering all kinds of kit or exotic locations, amongst the charities clamouring for attention and donations, sat atop of a black out structure was a life sized sperm whale and blue whale. It could mean only one thing. WhaleFest had once again brought it’s passion for the ocean, and army of volunteers, to the Show. Entering the darkened space it took only a moment for the eyes to adjust and to then widen in awe as from all around life sized whales and dolphins abound. Hanging from the ceiling baby sperm whales, Risso’s dolphin, harbour porpoise, common, striped and white-beaked dolphin to name a few. Along one side a minke whale sits up with a calf beneath, in front sits a beluga. On the opposite side are a narwhal and two bottlenose dolphins. At one end a baby blue whale, and the other a mother and calf orca. The blue and patterned lighting gives the effect of being under the waves, the sounds of whales and dolphins from orca calls to humpback’s singing, gives the feeling of truly being immersed in the underwater world. On a table in the middle strange and wonderous artefacts light up the imagination, some of which seem stranger than fiction. A sperm whale tooth, the inner ear bone of a whale, the tusk of a walrus, the skull of a dolphin and of a sea lion are just some of them that awe kids and adults alike. Amongst the hustle and bustle of the Show, WhaleFest’s Incredible Ocean stand brings a corner of peace and inspiration. Inside our volunteers show all the amazing artefacts, challenging them to identify them, wowing them with the answers. Others meander looking around at the inflatables that seem as real as us, the light catching them in ways that mean out of the corner of the eye they might appear to move and be alive. All cannot resist taking pictures. All cannot resist regaling tails of incredible encounters they have had in the wild. There is no selling, advertising, endorsing. Just simple inspiration of our incredible oceans and the animals within. Blinking and returning to the bustle outside of the cocoon that has become the Incredible Ocean stand, but our presence does not stop there. As if in a dream passers-by encounter mermaids, with fabulous tails and wondrous hair. The message about our ocean continues, but with a bit more of a fact finding mission. Would people like to see the teaching about ocean become part of our national curriculum for our children…. There seems to be a resounding yes in response. At one end of the stand we now encounter section of green netting lying seemingly innocent on the floor. Willing passers-by are dressed either as turtle, or a dolphin, or simply in diving flippers and then attempt to climb through the netting in the fastest time. It quickly becomes apparent how easy it is to become entangled and how hard it is to escape…. Now imagine being under water and being unable to reach the surface to breathe…. The volunteers end up inside an almost dome of netting within which sit the amazing pieces of artwork artists have created using ghost gear – discarded fishing gear- for the World Cetacean Alliance’s Untangled project. 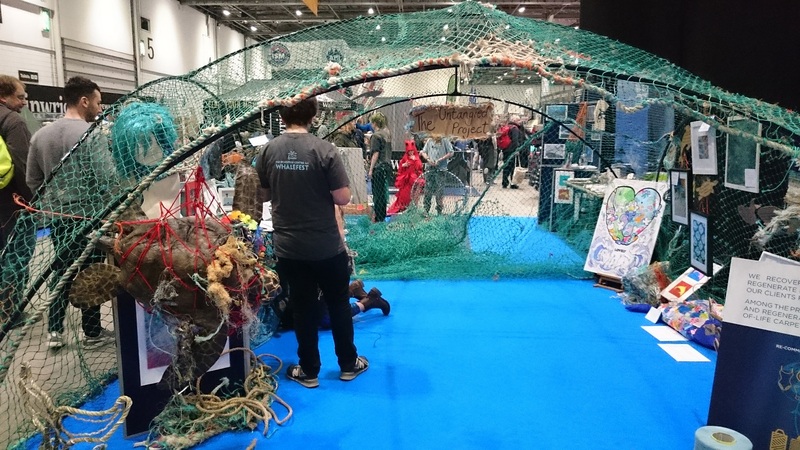 The pieces show how ghost gear can be recycled or recreated into something of value and are being auctioned off to help raise funds for the Net Effect campaign. So from the sadness and reality of entanglement, we see the positives of what the WCA and all its passionate partners and volunteers are doing to tackle the issue of ghost gear and entanglement. A light at the end of the green netting tunnel…..
As the end of the day draws near, I find myself retreating for one last time into the blueish darkness of the Incredible Ocean display and its inflatable whales and dolphins. Soaking up the calm, and the passion, fuelling me for the train journey home and recharging me until I can once again see, hear, and breathe in these incredible animals in the wild…. Roll on May. To find out more about the WCAs Untangled Project please click here. And to see all the pieces up for auction go to our ebay site! Also find out more about the Incredible Oceans outreach programme at the WhaleFest website!